Thanks to an alert blogger somewhere (I forget which one, my apologies), I was made aware that Lidl is having American week. I trooped over to a nearby Lidl and went shopping for all my favorite “American” products. For example, I could buy canned corn-on-the-cob! Nothing says FRESH like Canned. Now a lot of the American products were actually made in America, but not this one. 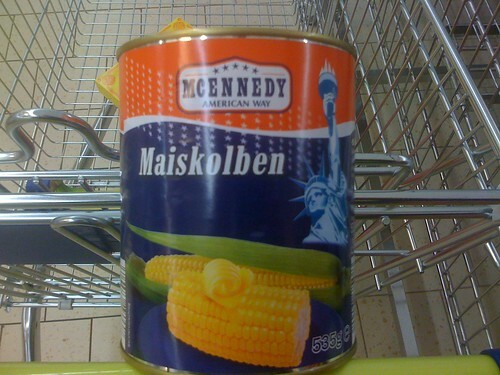 Now one would suspect that if it wasn’t made in America it was made in Europe, after all, why would you pay to ship canned corn-on-the-cob to Germany. Uh, just in case you weren’t aware of it, you might be opening the can of worms called “Canada and Tierra del Fuego are in America too, you know!”. Hey Cliff1976, you’ve sort of hit on one of my sore spots… I am aware of the can of worms–but I choose to ignore it, and if anybody wants to argue with me, they can try. To me, Lidl’s American week is all about the USA, United States, or, as they put it, America. I can’t think of any other country in North or South America that uses red, white, and blue in the way that America does and that is used in the Lidl American Way packaging. I doubt Canadian would really claim the statue of liberty (one dubious exception to be posted on Wednesday this week) as a symbol of Canada. As for the whole Canada and Tierra del Fuego are part of America thing–that argument is weak. I doubt any one objects to people from Mexico calling themselves Mexican–even though, I might point out, that the formal name of Mexico isn’t Mexico, it’s Estados Unidos Mexicanos — which one could reasonably argue is, in English, United States of Mexico. (United States of America in Spanish is Estados Unidos de América). If you can shorten it to Mexico, you should be able to shorten it to America. Furthermore, people from other countries in North and South America can call themselves names that reflect their home country: Brazilians, Colombians, Canadians, or Mexicans. To protest the fact that people from the USA call themselves Americans is odd–what else are they going to call themselves? Chopped Liver? As for other continents: Europeans might call themselves European, but really, I can’t recall the last time I heard themselves refer to themselves as European–unless they come from an obscure country (Luxembourg? ), they tend to say that they are German, French, or whatever particular narrow subpopulation they fall into (See, for example, English, Welsh, Basque, etc…). Asians? If you call yourself Asian, that covers a lot of territory without actually saying anything. African, at least in the English used by Americans and people in Europe, seems to presume by default that the individual in question is Black–although people from Northern African nations aren’t black, and a decent percentage of the population south of the Sahara isn’t black as well. My first year in Germany, I was confronted with this argument in my first German course, and a woman from Chile was upset with me when I said I was an American. I didn’t really want to argue with her, so I changed to “Ich Komme aus den USA”, which, to me, lacks the warmth and intrinsic truth of saying “Ich komme aus America,” but fine, whatever. A week or two after this I happened to need to visit the foreigners office, which was, at the time, divided into two departments, one half served citizens from countries starting with A-L, and the other serving M-Z countries. In case you weren’t certain, there were lists of the countries in each segment of the alphabet. “Ah ha!” I thought — Given that Germans should be sensitive to this difference in naming citizens, surely I would be under “U” for USA. 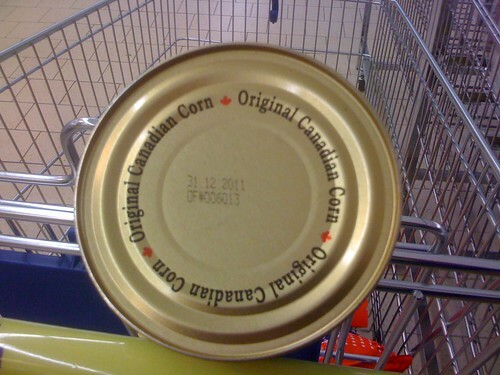 That can o’ corn comes along just in time for Canada Day, eh? I gotta head over to Lidl and grab one of those puppies. In fact, a close-up photo of “Real Canadian Corn” is going on my sidebar one of these days. Thanks! I hope your Lidl has them in stock. If not, feel free to use my photo in whatever way you want. Random question that I’ll ask you, but not expect you to answer: Is there any reason that the Canadian runs between Saskatoon and Edmonton at night — both directions? From my brief read of the comments, I understand that there may be worms in that canned corn. And whenever someone tries to call me a US-American/US-Amerikanerin, I get the urge to slap them silly. It’s plain old American. Get over it, Tierradelfuegoians.